March 2016 will be tilt’s 11th anniversary, and we’re arranging special events for celebrating more than a decade of dedication to art and ​the education of the artists’ photographic processes. A Tale of a Decade, curated by Ellee Bokharachi, tilt’s new Assistant Director & Art Critic, will showcase a variety of work by tilt’s represented artists. 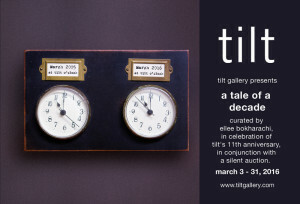 In celebration of our anniversary, tilt will host a silent auction. Throughout the month of March, all items will be up for bid and purchase exclusively at tilt gallery. The preview and “buy it now” option is available online, and bidding, which starts at half price of the retail value, will only take place at the gallery and via email (info@tiltgallery.com). Bids will be closed on March 31 at 8:30 pm at tilt. To make it more celebratory, bidders will automatically be entered into a lottery for a chance of winning an art piece. Every weekend, during the month of March, we will be having a raffle at the gallery. Come and get a ticket for a chance of winning a beautiful and precious piece of art. In our anniversary month, we will be introducing the “Print Parlor,” which would give our art collectors and visitors a chance to view the prints, in a setting different from our ongoing exhibitions. Furthermore, we will be introducing the Young Collectors program, which offers longer installment plans so that the youth can afford and experience the joy of living with artworks. Tilt Gallery is on the lookout for creative-minded individuals who specialize in creating pieces that reflect a connection to curiosity and innovation! 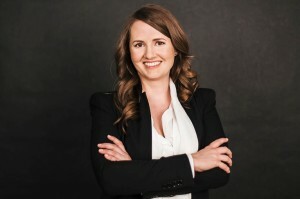 Opening Reception: Thursday, July 7, 2016, 7-9 p.m.
About the Juror: Claire C. Carter is Curator of Contemporary Art at the Scottsdale Museum of Contemporary Art where she has curated exhibitions of visual art, architecture and design since 2007. Among the original exhibitions she has presented are Covert Operations: Investigating the Known Unknowns (recently on view at the San Jose Museum of Art); The Five Senses: Janet Cardiff, Olafur Eliasson, Spencer Finch, Roelof Louw, Ernesto Neto; Narrow Road to the Interior: Contemporary Japanese Artists­; Architecture + Art: Héctor Zamora; MASHup: New Video Art; and At the Crossroads of American Photography: Callahan, Siskind, Sommer. She is an author of three books co-published by Radius Books and has received awards from the American Alliance of Museums, the American Institute for Graphic Arts and the Association of Art Museum Curators. 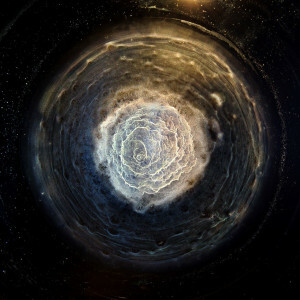 Her exhibitions have received grants from the Emily Hall Tremaine Foundation, the National Endowment for the Arts, and the Graham Foundation for Advanced Studies in the Fine Arts, among others. She is currently organizing Paolo Soleri: The City is Nature, a retrospective and monograph of the artist and architect, scheduled to open at SMoCA in fall 2017. Entry Fee will also need to be completed through Paypal. To learn more about the gallery visit www.tiltgallery.com. For questions e-mail info@tiltgallery.com.